Sun 20th Dec. 2- 5.25: Kim Smith brings us- Kim's Christmas Dance! Lest your eMail be missed; If no reply after about 2 days, please contact Barry again. the route details & maps there. Available printout includes Sunday bus routes/times. SUN 20th Dec Kim's Christmas Fun Dance - 15/Dec 17th December. 3rd Jan 2016 - Geoff Cubitt & “The Night Before” 16/Jan December 28th. The Special Bonus, fun dance is on the Sunday before Christmas. If NEW to this, be sure YOU get several turns in your same starting direction. See this all shown & called in an: Easy Contra Dance as the above details are explained HERE in the next American uTube video. Rarely, the caller announces a dance in Proper lines, just the way the couples initially form in this uTube lesson 5 above. (In the US, you'll find they call their women "women".). Vic & Mollie played superbly on 29th Nov in American Style. ABOVE - the Catholic Chaplaincy Hall - MAP. Dances 2:00 - 5:45pm ﻿S﻿undays. 48 bus stop 1 min. University R﻿﻿ail ﻿S﻿﻿tatio﻿﻿n﻿ 12m﻿﻿in walk. click for - R﻿﻿ai﻿﻿l / ﻿walk / bus﻿ details HERE. It's a regret that NO students from nearby B'ham Uni, or even Cath Soc have tried the Contras at the Chaplaincy. Another is that relative convenience of public transport on this website was used to advantage by very few. Young & ethusiastic bands and callers are nonetheless greatly appreciated by all of our dancers. The new part-time Warden anticipates at least a 30% price-hike from the dances in 2016.
which have often inadequately reflected their travel and other costs. Band fees have been personally subsidised, where remuneration has seemed particularly unjust. Above & on our many Dance fliers - adverts for our Dances do much to "sell" the Chaplaincy Hall & its good points. But facilities at the Chaplaincy Hall have deteriorated, even since a personal offer to buy sound absorbing foam. In Cornyx Lane, Solihull, it's usually less than a 6min easy drive from M42 J5. This would seem likely to need to be our future long-term venue. The Hall is directly indicated on the map below. Adult PREPAY PRICE £6 (Student or u18 £4:50). In Cornyx Lane, Solihull, it's just 4min drive from M42 J5. PARKING is plentiful and safely enclosed. then to the right of the hall to park behind the hall itself. Brian Stone is.more usually seen bowing on less strings than here. Brian founded earlier brilliant bands, especially "Hoedown" and "Junction 24". Brilliant Contra dance music from Brian & Elaine in the American Style. Elaine Meechan has long been a prominent player in the band Skylark - practising keyboard skills on a road-sign here. For our Sunday gig, we intend to persuade Elaine from the street ! John - a longterm caller and writer of dances. John persevered in recovery from a serious stroke. He's successfully calling again & on occasions, he's also seen to play his "tina". A recent definition: Zesty music & high-energy dancing. It's English tradition brought up to date and given a Trans-Atlantic twist. ANOTHER AVAILABLE ﻿IN﻿ THE LO﻿UNGE, DURNG THE INTERVAL . Get the same discount on the - Online prepayment page. These will next be available at the door from November 29th for 2016. SHARING TIPS ABOUT THE DANCE MOVEMENTS. Available HERE - NOW ! SUN 6th Sept Mark Elvins with a FIRST CLASS "FIRST"
- The 1st together gig for - Minor Contravention. Nicky of "The Night Before" : Ian & Charley : we managed to nick from the brilliant "Vertical Expression". FLIERS HERE for this NEXT DANCE. Please encourage shared contra fun - by printing & distributing the fliers. Nicky to wow-us with her wild fiddle from "The Night Before". The mystery question everyone is asking: What instrument will Charley play? Just come and see ! Share & enjoy dancing to their brilliant music ! Ian . . . . . . . . . . . . . . . . . . . . . . .Charley. . . . . . . . . . . . . . . . . . . Nicky. Please encourage more shared contra fun by printing & distributing the fliers. 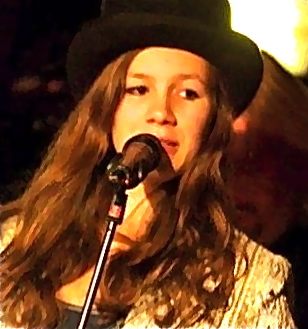 USA ............ At the NW Folk Festival in Seattle .............. Mary Devlin calling. SUN 25th Oct John Meechan with Brian Stone & Elaine. You're at the ﻿﻿﻿﻿﻿CONTRA what's that?﻿﻿﻿﻿﻿ page. Best come to sample the dances - find out what fun they are ! Contras are lively and friendly occasions. Expect a variety of partners. You're here to enjoy. Variety is a great way to pick-up Contra-technique. "Getting right" an unfamiliar dance: sure - that involves a bit of brain-work. will be available HERE - soon AFTER THIS SUNDAY'S DANCE ! Annie with Les. Val dancing with Harry. Buy at the "da﻿﻿nce b﻿efore" for a DISCOUNT Adult £2 (Student £1.50). FLIERS for NEXT CONTRA - 28 JUNE HERE. Encourage more shared contra fun by printing & distributing the fliers. D﻿ance-Fliers for SUMMER CONTRA (12th JULY) HERE. Kindly do print & distribute these fliers too. Enjoy our last of season Summer Special Dance. Lively Contras - but interspersed with more gentle material for this Summer afternoon. On July 12th - join and enjoy our last of season Summer Special Dance. The brilliant, vibrant duo Recursion in action - Grace on violin & Sam on bouzouki. probably the most popular of Midland callers, at festivals, and every kind of event. A great dancer himself - you learn through lively dancing. Come along to find your personal dancing ability being extended at a great tempo. Discover how your dance can improve with a minimum of plodding about beforehand. ﻿Your excellent musicians: ﻿R﻿ecurs﻿ion. CLICK FOR LINK.﻿ Sam fired by amazing Grace's fearsome fiddle. 2) You can: Prepay also at the door for the following dance. Enjoy ALL remaining (7) 2015 dances at £6.14 each (per Adult) !! Bu﻿y 20﻿15 Se﻿ason﻿ ticket - now £43 - AT or up to the 28th June Dance. LAST CHANCE - value. (£6.13 per dance) Much less than door, or prepaying every one. This "SEASON TICKET" still optionally available "at the door" - ONLY UNTIL 28th June. On July 12th join and enjoy our last of season Summer Special Dance. 3) Same saving available here on line, through your bank. FPS PREPAY THROUGH YOUR BANK. YOU NEED REVEAL NO PERSONAL DETAILS WHATEVER ON LINE !! HERE ABOVE : The Catholic Chaplaincy Hall - B1﻿﻿5 ﻿3Q﻿﻿﻿S. Dances 2pm - 5:﻿45﻿pm ﻿S﻿undays. For the MAY 17th DANCE, WE ARE BACK AT THE CHAPLAINCY HERE. Bu﻿y 20﻿15 Season ticket - now £43 - AT or up to the 28th June Dance. This is good value. (£6.13 per dance) Much less than door, or prepaying every one. "SEASON TICKET" still optionally available "at the door" - on 28th June. This method reveals NO personal details on line ! ARRIVE AT ﻿1:30: SHARE A SOCIABLE HOT DRINK COST INCL. Even better value with a Season Ticket available at the door. SUN 22nd Nov Jake Wood with Double Dichotomy. Enjoy ALL remaining (8) 2015 dances at £5.87 each (per Adult) !! Bu﻿y 20﻿15 Season ticket - now £47 - AT or up to the 17th May Dance. This is good value. Much less than prepaying every one. "SEASON TICKET" still optionally available "at the door" - on 17th May. You can always "click on blue" on this website. Above - a you tube link. The video sound has one of ECDB Linda's best musical extem﻿porisation﻿s. It's around the memorable tune for (a French-Canadian dance) "La Bastringue". 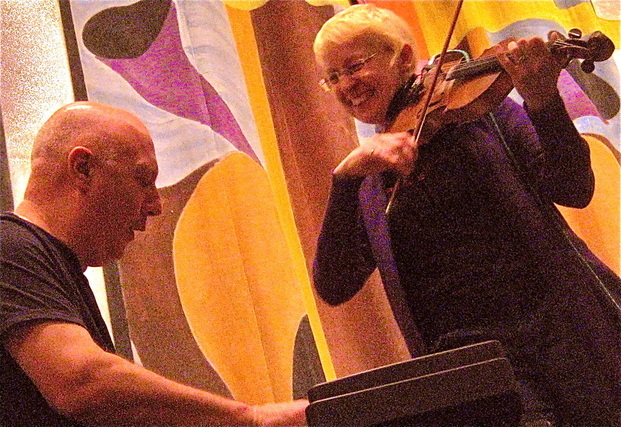 On May 17th we enjoy again the acclaimed English Contra Dance Band. Deservedly established: ECDB are much sought after for dances, festivals & Halsway. You're at the ﻿﻿HOME﻿﻿ page. Tickets £2 discount per Adult form: Faster Payment Service pay for above 3rd April dance. Form AVAILABLE HERE . £2 discount per Adult. DISCOUNT AND : Form AVAILABLE HERE NOW until 2pm Thursday - 2nd April. HERE ABOVE : The Catholic Chaplaincy Hall - B1﻿﻿5 3Q﻿﻿S. Dances 2pm - 5:45pm ﻿S﻿undays. 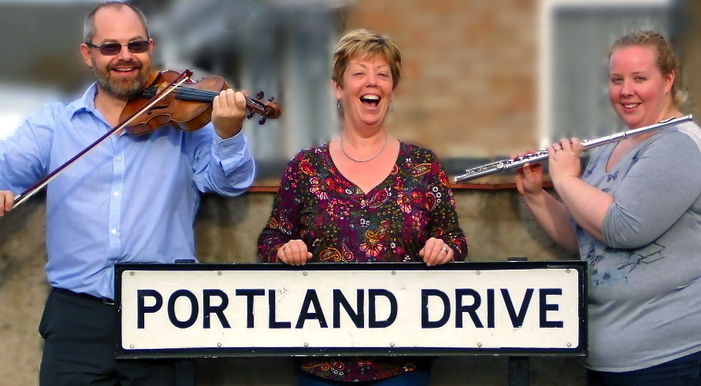 - BUT FIRST WE DANCE on Apr 3 in BOURNVILLE to BOB & "PORTLAND DRIVE". DETAILS BELOW: or CLICK HERE for the GOOD FRIDAY AFTERNOON Page. CLICK HERE for the GOOD FRIDAY AFTERNOON Page. M CLICK HERE for the GOOD FRIDAY AFTERNOON Page. May 17th we enjoy again the acclaimed ﻿English Contra Dance Band. ﻿Sorry if you missed Sun 1st March's brill Brummie Contra. - who will be back again in Nov.
- These Dances - mainly in American Contr﻿a style. 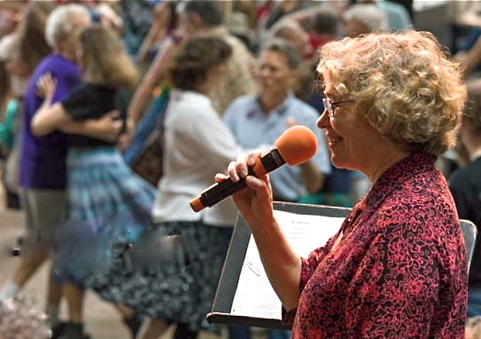 NEXT - We welcome the memorable ﻿English Contra Dance Band. Enjoy ALL remaining (10) 2015 dances at £5.50 each (per Adult) !! Bu﻿y 20﻿15 Season ticket - now £55 - AT or up to the 22nd Mar Dance. You would need to miss 3 of the dances before this Season Ticket exceeds the door cost for the rest. "SEASON TICKET" still optionally available "at the door" - 22nd March & 3rd Apr. Whyever leave a date with "to be announced"? Surely that guy can get a band booked for then ! ! ? brilliant gig with Brummie Contras. Fat Harry & in Corporate Fiddle. Your personal dancing ability becomes extended with minimum of plodding about beforehand. Uni﻿versity R﻿﻿ail ﻿S﻿﻿tatio﻿﻿n﻿ 12m﻿﻿in walk. Possibility of Sunday roadworks nearby. Yesterday (Fri) eve, part of Somerset Road to the South of Harrison's Rd was shut. Pritchatt's Rd, Richmond Hill Rd & the complete crescent of Farquhar Rd being fully open: access to Harrison's Road was THEN from its Richmond Hill Rd end. So some may need a very short detour. MAP page. There's a bright, sunny forecast for your mid-day journey. Some may enjoy a particular contrasting dance. state any preference (include on your email prepay-form) by Friday 20th Feb.
SUN 27th Sept - DATE CAN﻿CEL﻿LED DUE TO DOUBLE BOOKING OF HALL ! - for this, a VERY high probability that we may enjoy an American caller. SUN 20th Dec Kim Smith - Kim's Christmas Dance-Party with Contras. Enjoy ALL remaining (11) 2015 dances at £5.36 each !! Buy 2015 Season ticket (£59) up to, or AT the 1st Mar dance. This is good value. Only if you find that you miss 2﻿ o﻿f the dances does this become even equivalent to prepaying every one. You would need to miss 4 of the dances before this Season Ticket exceeds the door cost for the rest. "SEASON TICKET" will be optionally available "at the door" - 1st & 22nd March. ﻿T﻿h﻿is dance on Friday afternoon at Da﻿m﻿﻿e Elizabeth Cadbury Hall, BOURNVILLE B30 1BU. SUN 27th Sept - DATE CANCELLED BECAUSE OF DOUBLE BOOKING OF HALL ! - for this, there's a high probability that we may enjoy an American caller. SUN 25th Oct tbc with Brian Stone & Elaine. Buy 2015 Season ticket (£59) up to 1st Mar dance. This is good value. Only if you find that you miss 2﻿ o﻿f the dances does this become equivalent to prepaying every one. SEASON TICKET will be an option available "at the door" - 1st & 22nd March. For some of t﻿heir ﻿music ﻿on ﻿"my-space"
Well known from their playing at Sidmouth, Broadstairs & Towersey. you're at ﻿﻿H﻿OM﻿E﻿﻿ page Dances 2:00 - 5:45pm Sundays. 48 bus stop 1 min. Uni﻿versity R﻿﻿ail ﻿S﻿﻿tatio﻿﻿n﻿ 12m﻿﻿in walk. Rail / ﻿walk / bus﻿ details. Your personal dancing ability becomes extended, with a minimum of plodding about first. Latest (2nd Feb) 2015-D﻿ance-Fliers HERE. HERE at the Catholic Chaplain﻿﻿cy H﻿all. ﻿B15 3QS﻿. Dances 2:00 - 5:45pm Sundays. 48 bus stop 1 min. Uni﻿versity R﻿﻿ail ﻿S﻿tatio﻿n﻿ 12m﻿﻿in walk. Rail / ﻿walk / bus﻿ details. Our caller guides you through dances mainly in American Contr﻿a style﻿. [ Some may enjoy a particular contrasting dance. NE﻿XT ﻿ONE - Su﻿﻿n﻿d﻿ay ﻿25th Jan﻿ 2.00pm to 5.﻿45p﻿m. AMAZING Ve﻿r﻿t﻿ical﻿ Expr﻿e﻿﻿ssio﻿n playing. "Click on blue". ﻿ The UK's BEST LOVED CONTRA & Ceilidh BAND - at "BRUMMIE CONTRAS". 'Ver﻿ti﻿﻿ca﻿﻿﻿l Ex﻿p﻿re﻿﻿s﻿s﻿io﻿﻿n' for more about them on line "Click" on the blue. A pleasant pedestrian/cycling alternative to following the 48 bus route. Starting through the Hospital grounds. Walk West from University Station to the main entrance of the NEW QE Hospital. Fruit stalls available outside. Outside the entrance turn North (right) to walk under the massive overhead hosptals' link bridge. At the road continue North (along a very short length of Mindelsohn Way). You walk past the Women's Hospital, and a large statue, as you continue North, when Mindelsohn Way turns East. You have now reached its cycle and pedestrian end-access, and continue along Metchley Park Road. Sports fields are now behind hedges & trees to either side, continuing North up Metchley Park Rd. At the roundabout (c250 yds) turn right briefly into Somerset Rd, then left into Harrison's Rd. The view at the head of the pages is then a few steps along on your left. "American Contras" are played in energ﻿﻿etic style. You're helped in each dance through its sequence of moves by our caller. Every contra dance h﻿as its very own series of moves which you repeat with each cou﻿ple that you meet as you move along. That's down the set, and away from the caller if you begin as "ones" (that's facing down as you start "hands 4"). Movements are generally fairly smooth and slick - without the step-hops of many ceilidh dances. Some like to extemporise in Contra - often by adding spins and twirls. Many still very keen on this dancing, but wishing they were younger ! A few maintain a very gentle style - recovering from injury, or because they enjoy the company & music but wish to dance at their pace. you're at ﻿﻿﻿﻿﻿CONTRA what's that ?﻿﻿﻿﻿﻿ page. Why don't you come along. Sample these dances to find out what it's like ! Contras are lively and friendly occasions. You're here to enjoy. "Getting right" an unfamiliar dance involves a bit of brainwork too - but a few mistakes hardly matter. A fairly good recovery afterwards is the fun challenge. "American style contras" are energ﻿﻿etic - you're helped in each dance through its sequence of moves by our caller. Every contra dance has its very own series of moves which you repeat with each couple that you meet as you move along. Movements are generally fairly smooth and slick, without the step-hops of many ceilidh dances. Contras are a great occasion for the young and keen. Many are very keen on this dancing, but wishing they were younger ! ﻿ The UK's BEST KNOWN CONTRA & Ceilidh BAND - at "BRUMMIE CONTRAS". ﻿ The BEST KNOWN CONTRA BAND in the UK - at "BRUMMIE CONTRAS". 'Ver﻿ti﻿﻿ca﻿﻿﻿l Exp﻿re﻿s﻿sio﻿n' for more about them on line "Click" on the blue. ARRIVE ACCOMPANIED OR NOT – YOU'RE WELCOMED ﻿!﻿ AT CONTRAS YOU'VE LOTS OF DANCE PARTNERS. 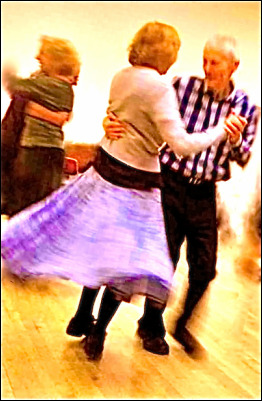 Most contra dancers like to improve skills by regular partner changes after 1 or 2 dances. Anyone asks anyone else to dance – Go for it ! - then click on the download icon of your device. This should open the FORM for you to FILL-IN. 25th Jan dance - email it by 19th Jan.
﻿Our caller guides you through dances mainly in American Contr﻿a style﻿. Some may enjoy a contrasting favourite Dance. state any preference - and email form by 17th Jan.
﻿This dance ONLY﻿ will be on Friday afternoon at the Da﻿m﻿﻿e Elizabeth Cadbury Hall in BOURNVILLE (B30 1BU). This remains VERY good value: BETTER value than individual dance PREpayment - even if you find that you miss 2﻿ or 3 o﻿f the dances. HERE at the Catholic Chaplain﻿cy Hall. B15 3QS. 2:00pm to 5:45pm, Sunday afternoons. ARRIVE 1.30. SHARE A SOCIABLE HOT DRINK COST INCLUDED, IN THE LOUNGE. ALSO IN INTERVAL. Were you here? At this year's 1st superb Brummie Contra ! Sharing Bob's brilliant, fun, "Northern Lights"?
" Ver﻿ti﻿﻿ca﻿﻿﻿l Exp﻿re﻿ssion " for more on line "Click on blue". Please come to give CONTRA-DANCING a TRY. And there's 3 or 4 essential lively contras for we addicts. Sunday 21st Dec 2.00pm to 5.15pm. and an introduction to Contras and much MORE. Due to this being very close to Christmas, not many bands are available. So this event will go ahesd to recorded music, with a lower adult door price of £7. Arrivals from 1.30 get a hot drink in the lounge. Another hot drink and a minced pie will be included in the interval. "On the door" ﻿﻿£8.50 (student £6.50) ﻿-﻿ Download prepayment form HERE - then click on your download icon. This should open a form for you to fill-in by 15th Oct. The earliest prepayments get a £2 DISCOUNT ! once again in their awesome foursome ! At our Contras, you've often seen Re﻿cursion﻿ play﻿ing. Click on the "blue" to enjoy some of their music. Better still, dance to the brilliance of Sam & Grace with Nikki & Ozzy at our next energetic Brummie-Contra. Below - for your diary - All (13) ﻿2015﻿ Brummie-Contra Dates to next December. ﻿Bob Mo﻿﻿rgan﻿ calls: ﻿Re﻿c﻿urs﻿ion4 play﻿ing. ENJOY STARTING YOUR DANCING YEAR with BOB & this DYNAMIC NEW CONTRA FOURSOME.